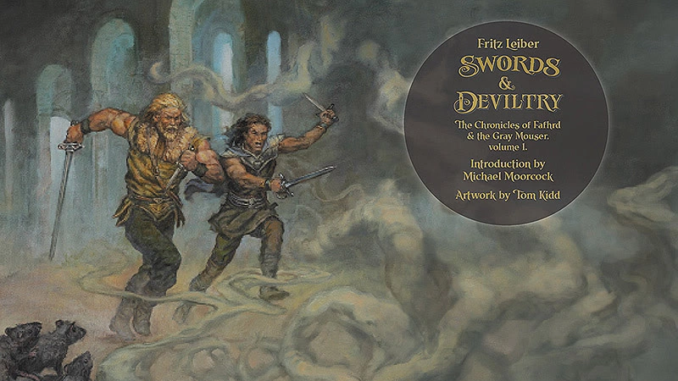 Swords And Deviltry is the first book in the Lankhmar series by Fritz Leiber. It collects three shorter stories that introduce Fafhrd and the Gray Mouser and show what led them to travel together. The book was written as a prequel to the other stories, though as a first impression of the series, it’s far from perfect. The Snow Queen opens with a bit of backdrop about the Fafhrd’s homelands of Cold Corner, which the traveling theater recently arrived at. The lands of Cold Corner are governed over by the tribe’s matriarchs called The Snow Women, the leader of which is Fafhrd’s mother, Mor. Fafhrd, however, dreams of leaving these barbaric lands and traveling to civilization, a place which fascinates him to no end, but the icy magic of the Snow Women means that he may befall a similar fate to that of his late father were he ever to leave. This novella is a lot slower than most of the Sword & Sorcery Fantasy stories that I’ve read so far, with a lot of time spent setting the stage before the real action begins. The only time there’s a break in the story is once near the beginning and another before climax. But the pace does pick up around the time Fafhrd finally decides to leave his homelands with Vlana, an actress of the traveling theater, and venture off toward civilization. Overall, it’s an all right story that’s somewhat bogged down by all of the initial setup. The drier parts of the world-building could have been shown in a way that was much more interesting to read. The story does a good job at least of establishing the character of Fafhrd and making the reader care about him. The Unholy Grail, however, is much better paced than the story that preceded it, and much more exciting as well. Though it introduces the character of Mouser, the story is told mostly from the perspective of a girl named Ivrian, one of Mouser’s fellow magic students. But we do see a few of scenes from Mouse’s perspective, such as the opening scene where he discovers his magical mentor dead and his house in ruins and the story’s climax. This kicks off a quest for revenge against the man who murdered him: the Duke Janarrl, Ivrian’s father. So right from the start, there’s a strong conflict driving the plot forward. The backstory of Mouse is told through their memories of their mentor, Glavas Rho. This more direct tie to the plot motivation makes it more interesting to read about, and barely a word is wasted in telling it. Throughout the story, the suspense was kept at a high, with tension escalating as each scene played out. Because it’s mostly told from the perspective of Ivrian, there’s a mystery to what sort of magic Mouse uses which just isn’t found in many modern fantasies. Mouse actually has to tap into some pretty dark forces to get back at Janarrl, unlike the sort of magical superpowers of many fantasy books these days. Lastly, Ill Met in Lankhmar tells the story of how Fafhrd and Mouse, now The Gray Mouser, first met. It begins with the two of them both finding themselves fighting against the same enemy: a couple members of the thieves’ guild. This skirmish helps to bring them closer together, where they decide to go back to Gray Mouser’s current hideout after sharing a few drinks. Back at Gray Mouser’s place, he introduces Fafhrd and Vlana to his lover, Ivrian, and Fafhrd does likewise with Vlana. The two share several drinks, prompting Gray Mouser and Fafhrd to go out to restock. By the time they return, Vlana has filled Ivrian’s head with ideas about Fafhrd and Gray Mouser going off to get revenge against the thieves’ guild for their treatment toward Vlana. After an initial protest, the two men agree to scout the area out for a future assassination quest. The early part of Fafhrd’s and Gray Mouser’s exploration through the thieves’ guild is bogged down in a lot of description that doesn’t really add much to the story, or even help to set the stage for later on. Around this point is where the story’s pacing starts to slip, though it picks up again when they finally meet the warlock, Hristomilo, while exploring the guild. After this, the tension begins to ramp up and continues onward until the tale’s conclusion. Overall, Swords and Deviltry’s biggest issue is pacing, and while this is partly due to it being a collection of three shorter stories tied together, it is also because a couple of the stories really could’ve used a bit of editing. The book would’ve been a lot stronger had some of the slower portions been cut, and would’ve worked much better as an introduction to the series as well. But despite the book’s pacing issues, I still recommend that readers interested in tales of heroic fantasy check out the book. Fafhrd and the Gray Mouser are probably one of the greatest duos that I have seen in a Fantasy story. Even in just the single novella that they’re seen together shows their playful banter, the way that their individual strengths compliment each other, and them forming a close friendship. And there really just aren’t a whole lot of stories about a friendship between two men, even outside of the fantasy genre. So it is for that reason that I look forward to reading the rest of the Fafhrd and Gray Mouser books, and why I would suggest checking out Swords and Deviltry as well. Although they occur after the tales in this volume, I would recommend the stories in Swords against Death to someone who has never read about the adventures of Fafhrd & Gray Mouser before. They do a better job of giving the reader a look into Fritz Lieber’s world of Newhon, and in my opinion, are better written. But every reader should judge for themselves.